When planning a trip to Rome, many people often look for day trips from Rome, or head to the other big cities like Rome and Florence. 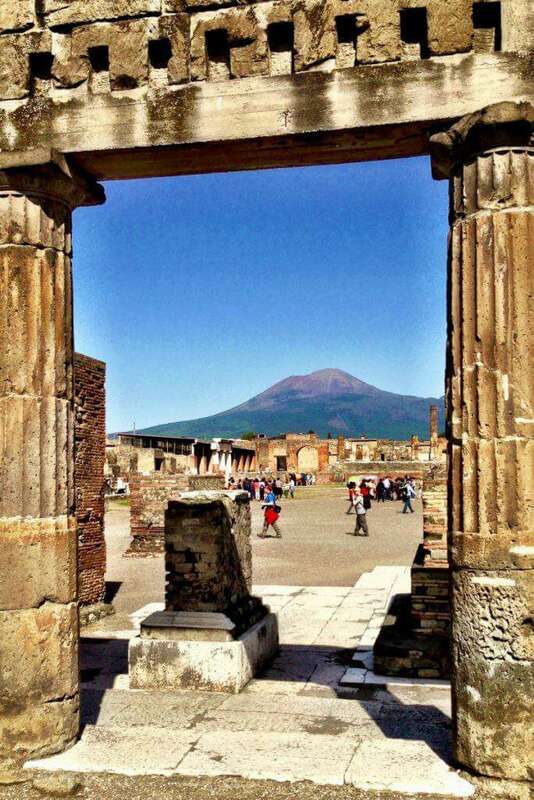 While it is possible to visit Pompeii and even Sorrento in a day, we would recommend spending at least a night in the area when traveling with kids. Sorrento has spectacular vistas, abundant lemon trees, and a charming town square. Pompeii is perfect for kids to run and explore, weaving in and out of the ruins as children would have before it was destroyed. Capri is charming and elegant, and it’s easy to take a ferry from Sorrento to Capri. 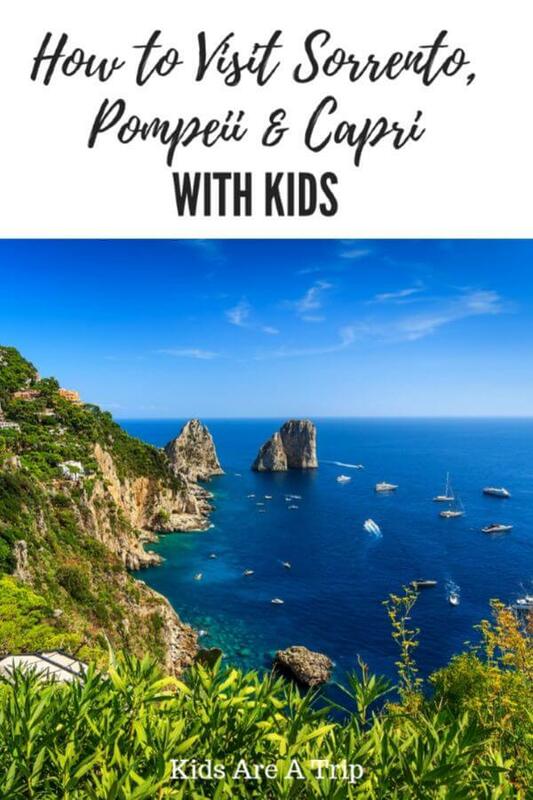 So instead of rushing through a journey south, make plans to stay awhile and enjoy the area of Sorrento, Capri, and Pompeii with kids. To reach Sorrento and other points on the Amalfi Coast, you will have to first travel through Naples. I say through Naples, because I have yet to find a reason to actually stop and visit the city. From Termini Station in Rome, you will catch a train to Napoli Centrale, the main station in Naples. Once you arrive, follow the signs downstairs to the Circumvesuviana trains. Buy a separate ticket there. The Naples train station is chock full of sketchy characters. Be mindful of the ones that offer to “help” you with getting your luggage onto the train. Kindly refuse. They are not there to help with your bags, if you know what I mean. The train to Sorrento is approximately an hour long. Mind your bags, there are a lot of tourists on the train, which makes it a prime target for small time thieves. I suggest standing or sitting with your backpack to a wall and standing away from a door. The location is unbeatable. This bed and breakfast is a couple of blocks walking from the train station, in a building on the main street, Corso Italia. Our host was the wonderful Luigi, who was charming and made sure we had everything we could possibly need. We rented the apartment they have available. There was a single bedroom with a large comfortable bed, and in the main room, they had put together three single beds to make a very large bed for the three kids. There was a kitchen where we could prepare our meals (very handy when traveling with a child with allergies), a bathroom, a washing machine (which means I can pack fewer clothes), and a balcony with a view to the ocean. It is also just down the street from the grocery store, restaurants, and the main piazza. This bed and breakfast in Sorrento was very clean, large, and comfortable. 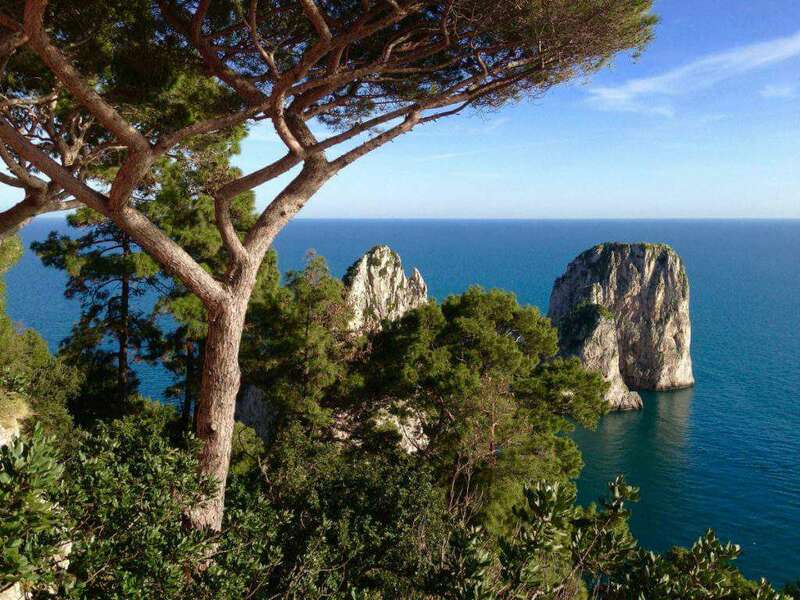 One of the reasons to visit Sorrento is for the wonderful views along the cliffs overlooking the Bay of Naples and its central location for exploring the region. There is a ravine that divides the shops and restaurants of the old town from the more modern area. We hiked from the town square to the top of the cliffs overlooking the Marina Grande for the traditional tourist “photo op”. After the kids finally cooperated, we decided to hike down to the marina, which led to an impromptu day trip to Capri. After taking the return ferry to Sorrento, we enjoyed wandering aimlessly through the small streets of the town, sampling the limoncello in the local shops, and of course stopping for gelato. We didn’t try any of the local restaurants because we had our own kitchen, but we always made time for gelato and sampled a couple of the gelaterias around town. There’s always time for gelato! There is a ferry between Sorrento and Capri that runs on a regular schedule, and it make the trip more frequently during the summer. 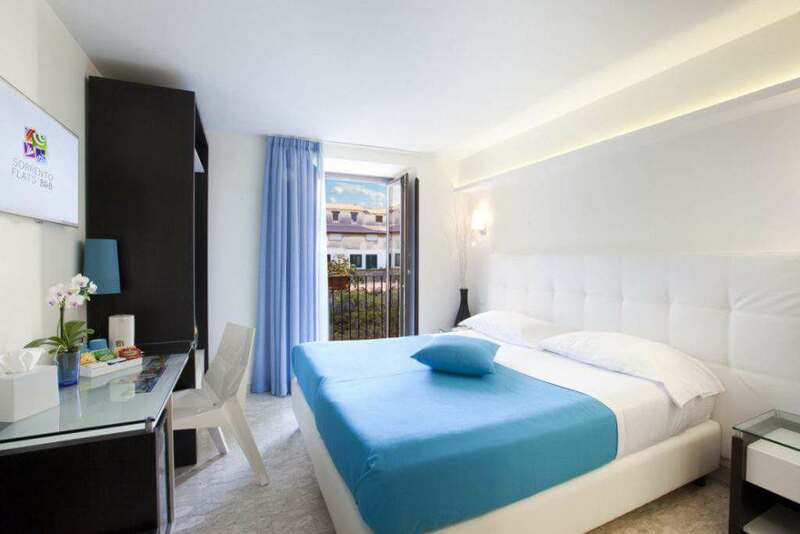 Make note of the last return ferry or you will find yourself needing overnight accommodation in Capri. The ferry takes about an hour and is not cheap, it can cost about 40 Euros round trip for adults, but there is a discount for children. 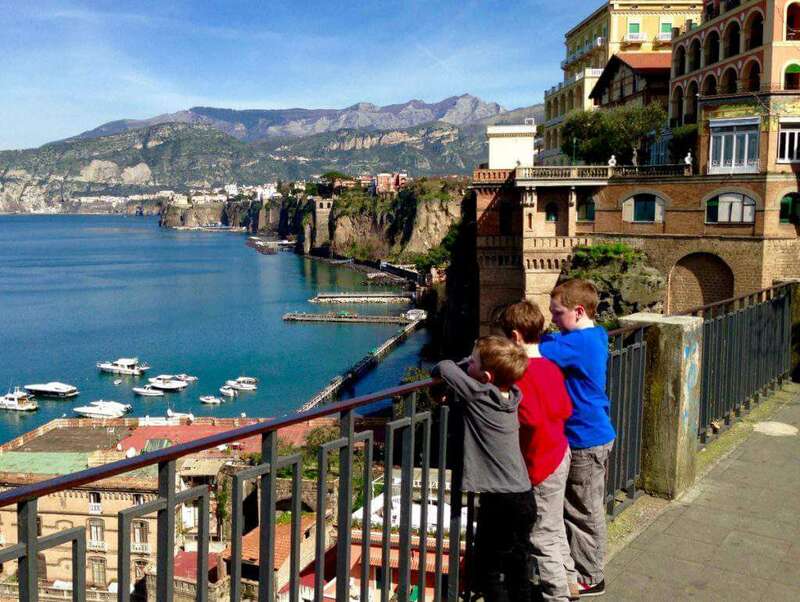 The kids enjoyed the boat ride and it provided us with beautiful views of Sorrento and Capri from the water. When we arrived in the Marina Grande, we boarded a funicular (which the kids found really exciting) and rode that up the hill to Capri. Unfortunately, we hit the town right during the afternoon riposo (translation: nap time), so all of the stores were closed. Via Camarelle is the main shopping street where the shops rival the finest boutiques in Paris. In other words, I couldn’t afford anything, and the riposo saved me from the embarrassment of “pretend” shopping. We took a leisurely stroll through town, which was easily the most enjoyable (and cheapest) part of the afternoon. The heart of the island is the Piazetta, where locals and tourists alike gather at the sidewalk cafés for afternoon coffee and drinks. After enjoying some refreshments, we headed back to the marina to take the ferry to Sorrento. We had to wait about an hour for our return trip, so we walked to the beach area. Unfortunately, it is not a sandy beach, but covered in rocks. The kids were unfazed and proceeded to skip rocks for the next thirty minutes (with adults joining in the fun). The ferry ride back was uneventful, followed by a steep climb up to Sorrento town from the marina. Can’t beat the view from Capri! It is fairly simple to visit Pompeii from Sorrento. Buy a return ticket to Pompei Scavi at the Sorrento ticket window. The train ride is a quick 30 minutes. Plan on arriving early in the morning, because it will take most of the day to explore, and it can get hot in the afternoon. Once you arrive, turn right, make your way through all the other day trippers, walk past the souvenir kiosks and food stands, and find yourself at the biglietteria (ticket booth). Purchase your tickets and be sure to grab a couple of maps (if you are like us, you will misplace at least one of them along the way). Once you have tickets in hand, pass through the turn-style, walk up the cobblestone ramp, and pass under the stone arch. Here you will find yourself transported to a world buried almost 2000 years ago when nearby Mount Vesuvius erupted and covered Pompeii in lava and ash. 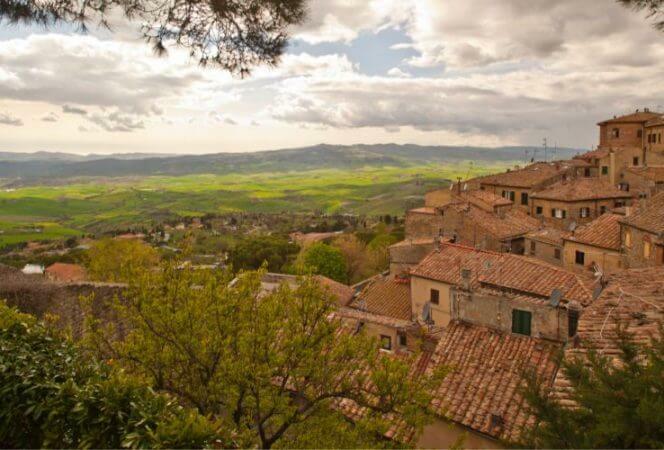 The city lay covered and undisturbed until 1748, when explorers seeking riches began to excavate a site called La Cività and the rest, as they say, is history. Today we are the benefactors of this natural preservation. The site is still not completely excavated, but there are ancient villas, baths, and an amphitheater for your family to discover. We made good use of the onsite café, stopping for water and coffee in the morning, and lunch later in the day. Our friend Franco came along and it was a good thing too, because we needed the extra hands to help wrangle the kids as they were often running in and out of buildings and up and down streets faster than we could keep up with them. In six hours we probably covered less than half of the site. We would have returned for a second day if we had the time. The kids also asked to hike up Mount Vesuvius, which we did not do, but there are several tour companies that will arrange day trips to the volcano. 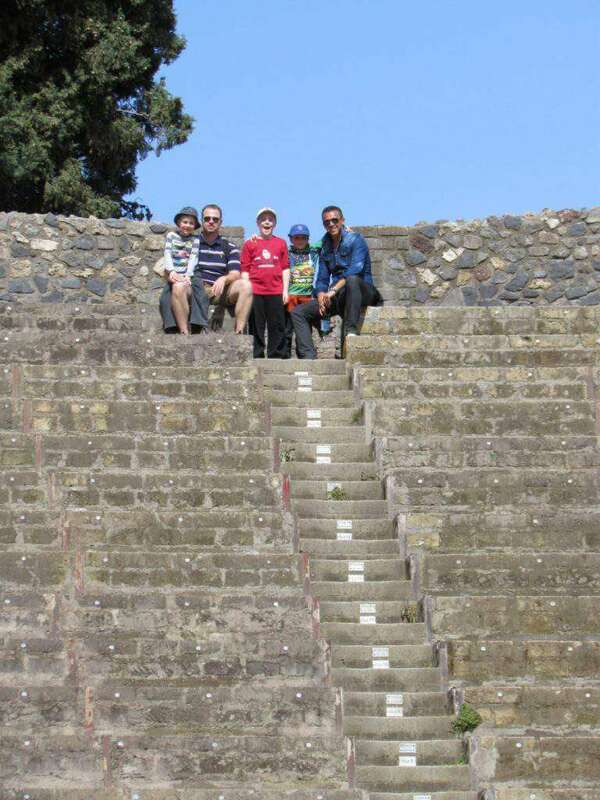 If you’re looking for a tour of Pompeii, consider using a company like LivItaly that runs kid friendly tours throughout Italy. In my book, Sorrento, is a charming, picturesque Italian village that is an optimal home base for day trips to Pompeii and Capri. 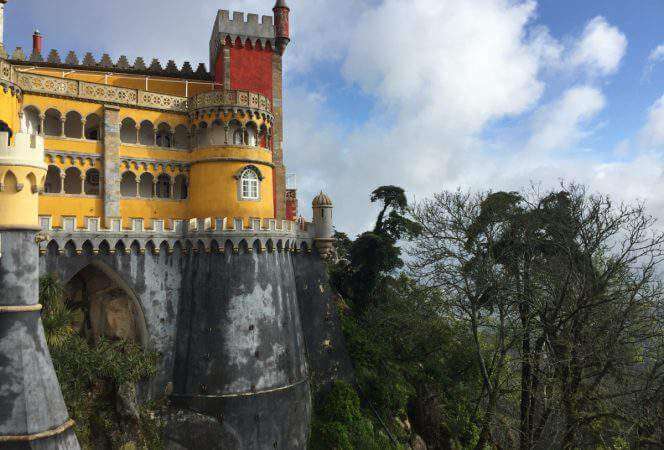 By using Sorrento as your base you give yourself the option of using public transportation to explore the area and save yourself the hassle of driving the dangerous hair pin curves along the coast and trying to find parking. 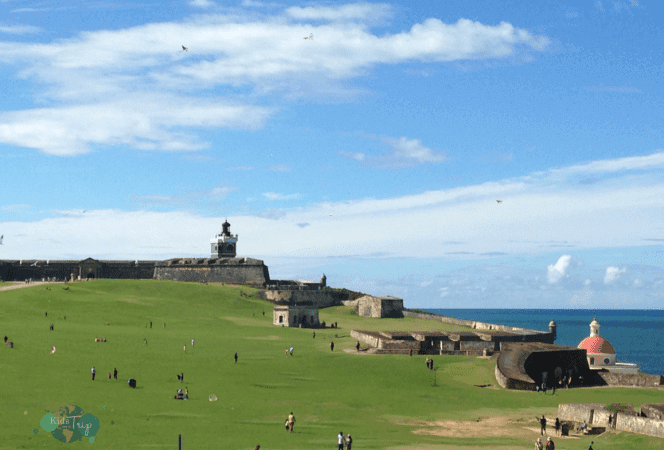 Visiting these cities with kids definitely lived up to my expectations, and planted the seed for my children’s desire to return someday, which is all I could hope for. Looking for other posts about Italy? 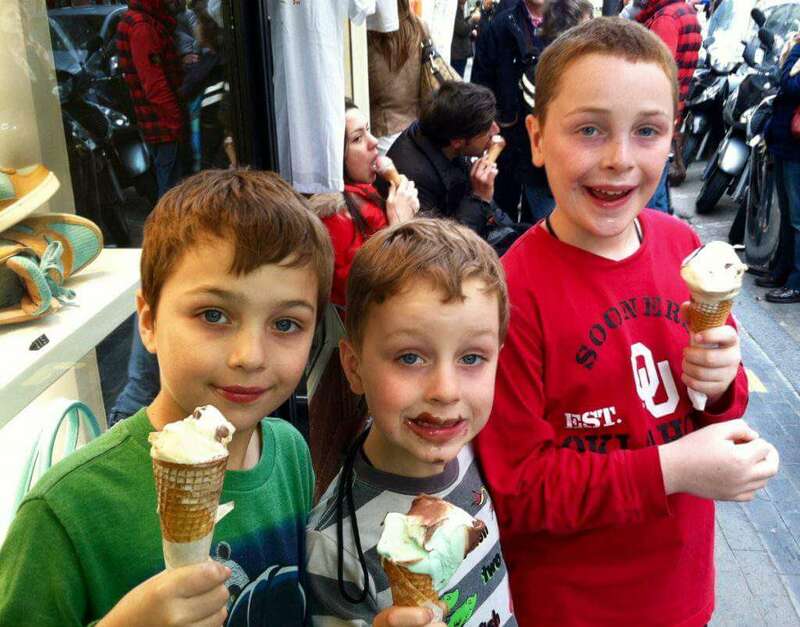 Check out Tuscany with Kids and How to Save Time and Skip the Lines in Rome. This post originally appeared in January 2017 and was updated in February 2019.